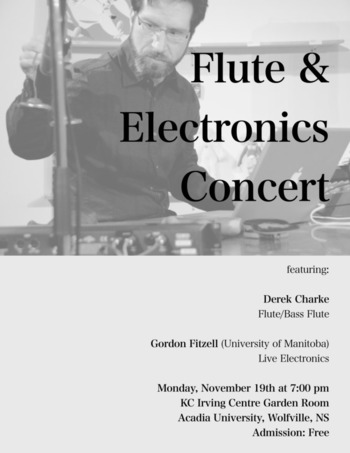 Flutist Derek Charke and composer Gordon Fitzell (visiting from the University of Manitoba) perform an evening of improvised music for flute and live electronics. Gordon Fitzell has worked with numerous outstanding ensembles including Norwegian group BIT20 Ensemble, Brazil’s PianOrquestra, the Ensemble contemporain de Montréal, and American sextet eighth blackbird, whose multiple Grammy-winning album strange imaginary animals features two of his works. A professor at the University of Manitoba Desautels Faculty of Music in Winnipeg, Fitzell teaches composition and leads the eXperimental Improv Ensemble (XIE). He also serves as Artistic Co-Director of the Winnipeg new music organization GroundSwell. Derek Charke is on the faculty of Acadia's School of Music.